Three gentle curves cut through the early winter fog on the Columbia River, as a barge named Umatilla propelled a new navigational lock gate upstream. It approached the McNary Lock shortly before 11 a.m. Wednesday, and 30 minutes later, it continued its voyage to the Lower Monumental Lock and Dam on the Snake River. Stimulus money bought the new downstream gate, which will become part of Lower Monumental as part of a major rehabilitation and maintenance project at eight U.S. Army Corps of Engineers facilities along the Columbia and Snake rivers. McNary Lock will close early in the morning Feb. 6 and will return to service five weeks later on March 13. Three facilities -- located at The Dalles, John Day and Lower Monumental -- will close their locks in just a few days on Dec. 10 and remain shut for 13 weeks or more. The closure will keep cargo from being shipped up or down the Columbia and Snake rivers. 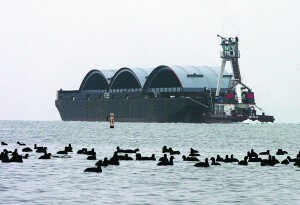 Material that would normally be shipped by barge this winter will have to be carried by trains or trucks. The closures will allow crews to complete regular maintenance on the locks and equipment replacement at four facilities, including McNary. The work is necessary to prevent unplanned emergency outages, according to the U.S. Army Corps of Engineers. Work at McNary is set to include regular five-year inspections, replacement of protective steel plating and, depending on available funding, repairs to a floating mooring bitt -- a link point in the lock allowing boats to stay secure. Maintenance at McNary will also include the replacement of eight damaged trash racks, or bar screens, located about 80 feet under the water surface. Marine Solutions Inc., a company based in Lexington, Ky., won the contract to replace the racks at a cost of $270,400.